The European Food Safety Authority (EFSA) reaffirmed the safety of titanium dioxide (TiO2) as a food additive in June 2018. However, we recognize the need for organizations in certain markets to have film coating alternatives that do not contain TiO2. Through our Nutrafinish® and Opadry® TF, TiO2 Free Formulated Film Coatings brands, we provide clean label solutions to the industry that allows manufacturers to differentiate products with color while aligning with market trends and consumer demands. Elimination of titanium dioxide provides manufacturers with an alternative coating finish that satisfies aesthetic appeal while addressing current market concerns. To learn more about what Colorcon is doing to meet consumer demand for clean label coatings, check out the whitepaper “The Natural Route from Core to Coatings” found on our website. Nutrafinish®, a series of immediate release film coatings in the Nutra product line, comprises formulations with properties to address clean label, swallowability, product stability, and manufacturing efficiency. In this edition of Connect with Colorcon™, we explore the stability challenges associated with naturally derived ingredients. Learn about what Colorcon is doing to ensure product quality and shelf life as well as regulatory considerations that impact product development. Colorcon had a strong presence at AAPS in Washington, D.C. in November 2018, presenting posters on our latest research shaking up the industry. Click on any of our poster reprints below to download the content. Our Indianapolis starch manufacturing facility is celebrating a milestone, with 40 years in operation this year. The Colorcon team based in Indianapolis marked this momentous occasion with a celebration honouring devoted employees and recognizing the important role that Starch 1500 continues to provide around the world. The Indianapolis plant has been instrumental in delivering the exceptional reliability and quality of Starch 1500 that is recognized across the industry. The site produces thousands of tons of excipient products every year that go into billions of tablets and capsules used in innovator, generic, nutraceutical and veterinary products around the world. The Inactive Ingredient Database (IID) provides information on inactive ingredients present in FDA-approved drug products and is used by industry as an aid in developing drug products. How can sponsors gain a better understanding of the FDA requirements and avoid lengthy review cycles, unnecessary requests for additional safety studies/information and Refuse to Receive (RTR) letters from the agency? Through a recent webinar, now available on-demand, leading global regulatory experts Dave Schoneker, Colorcon and Priscilla Zawislak, Dow Dupont together under the Controlled Release Alliance share their insight and describe how to use the IID to make good formulation decisions, overcome regulatory hurdles and get to market faster. The FDA recently approved the Color Additive Petition (21 CFR 73.200) submitted by Colorcon for the use of iron oxide as a color additive for use in dietary supplement tablets and capsules. This approval will allow the use of iron oxide in dietary supplement tablets and capsules (with a limit of 5 mg, the same as for US regulations for drugs), calculated as elemental iron, per day for labelled dosages, marketed in the United States. “These highly stable colorants provide high opacity and good coverage when used for film coating of tablets. They provide a broader color palette, widening the options available for branding and differentiation when used in combination with other pigments. 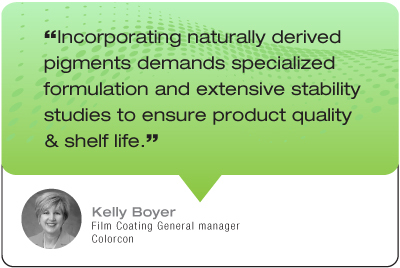 With our globally recognized color expertise, Colorcon will successfully utilize iron oxides as colorants across a broad range of dietary supplement applications, bringing an expanded spectrum of colors, with improved stability, to our customers.” Kelly Boyer, General Manager, Film Coatings. The Colorcon Color Guide is one of the most widely used tools across the industry; helping you to streamline your color selection process for pharmaceutical or nutritional solid dosage design. Colorcon takes the risk out of color selection with unrivaled regulatory guidance, custom match capabilities, and guaranteed color consistency. A refreshed version of the Colorcon Color Guide was launched in September 2018, and contains the general and iron oxide color wheels, as before, plus a new non-synthetic (natural) color wheel. Colorcon maintains a complete library of tablet film coatings, plus colorants that accurately match the colors shown on each wheel. We can help you explore an almost limitless variety of hues and shades. This is your starting point, with formulations developed to meet your individual coating needs and regulatory requirements. Our experienced technical service teams are experts in immediate and modified release solid oral dose development, helping our customers complete their projects - from product concept through formulation development and scale-up, to final production - in reduced timeframes. Through HyperStart® you can access starting formulations with process guidance and trial support, helping to lower your development time and cost. A complete range of drug release profiles can be achieved through HyperStart; simply complete the online request form, and we’ll respond back with a suggested starting formulation. Don’t forget, you can also access Colorcon’s regulatory experts and QbD support to smooth your submission process. To access HyperStart and submit your formulation request, simply Login and complete the online HyperStart Formulation Questionnaire. AFFINISOL™ hypromellose acetate succinate (HPMCAS) is a versatile polymer used to improve solubility by forming amorphous solid dispersions (ASD), for poorly soluble drugs. HPMCAS is frequently used for producing ASD via spray drying, and interest is increasing in its potential applications in hot melt extrusion (HME) processes. 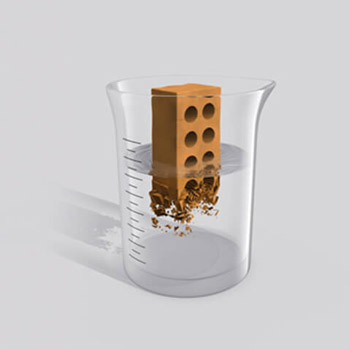 The performance of a formulation containing AFFINISOL™ depends on polymer stability after exposure to heat and mechanical stress during the process. To select the best process parameters for use of AFFINISOL™ in the HME process, formulators should understand the starting process parameters for HME and impact of the milling operation with AFFINISOL™. A recent study, presented by Colorcon, at the 2017 AAPS Annual Meeting and Exposition, San Diego, USA, reported on the effect of HME process conditions and post-extrusion milling operation on the thermal stability of HPMCAS and provide starting process parameters that ensure stability of the polymer. HPMCAS shows versatility as a polymer for solubility enhancement applications; it is easily hot melt extruded and resulting extrudates milled. AFFINISOL™ HPMCAS is available in several grades, and recommendations are available to meet individual application requirements. Guidelines for starting process parameters for AFFINISOL™ HPMCAS for hot melt extrusion and milling process with three grades of HPMCAS (716G, 912G and 126G) are available and Colorcon can provide guidance to help formulators reduce the number of initial steps when evaluating the processing window of AFFINISOL™. 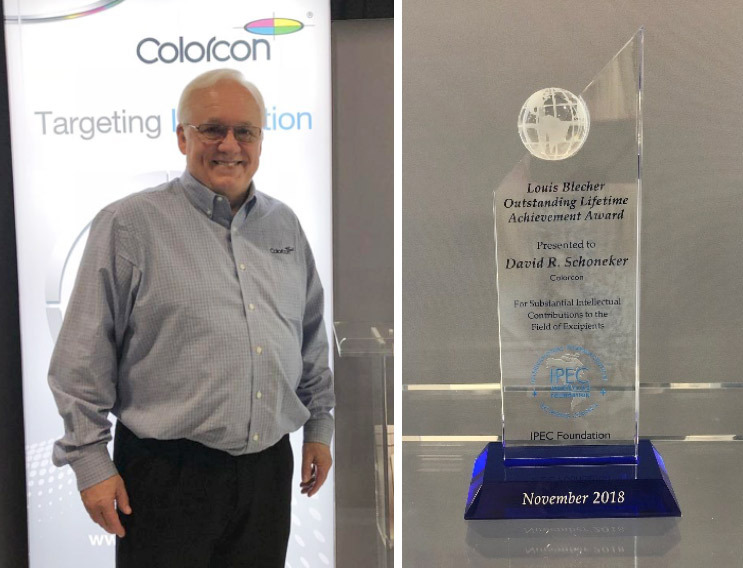 Dave Schoneker, Director of Global Regulatory Affairs at Colorcon, was honored with the Louis Blecher Outstanding Lifetime Achievement award at the IPEC-Americas Foundation awards dinner, held during 2018 AAPS Annual Conference in Washington, DC. He was recognized for substantial intellectual contributions to the field of excipients. 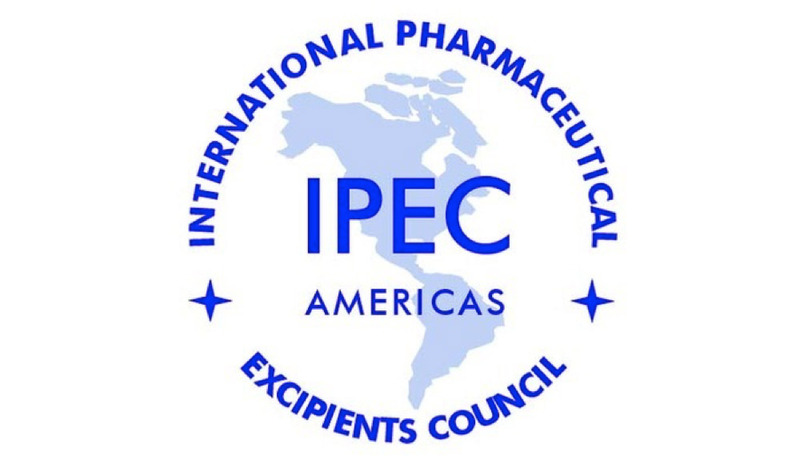 The International Pharmaceutical Excipients Council (IPEC) is a US industry association that brings together stakeholders that are committed to the safe and effective production and use of excipients. Dave currently serves as the Vice Chair for Scientific and Regulatory Policy for IPEC. In this role, he coordinates many science and regulatory projects for IPEC-Americas and acts as a key point of contact with the U.S. FDA, USP and many other regulatory agencies and pharmaceutical companies around the world. This award not only recognizes his contribution to the industry but reflects the unparalleled value that Dave has brought to Colorcon for over 40 years. If you have been to our website recently, you may have noticed the fresher look and accessibility of featured content. The recently redesigned homepage and the My Colorcon™ portion of our website makes access even easier, through multiple types of mobile devices. The new homepage provides a responsive display of the content that we feel is most important to keep you updated with featured products and services, thought leadership, news & events, and online resources. And, My Colorcon, your self-service portal, has been redesigned to make placing orders, requesting samples & information, or checking an order status more streamlined and intuitive. Please share your feedback and help us to continue to improve your online experience with us. For more information on any products or services mentioned in this newsletter, please Contact Us! ©Colorcon, 2019. The information contained in this document is proprietary to Colorcon and may not be used or disseminated inappropriately. All trademarks, except where noted, are property of BPSI Holdings, LLC. 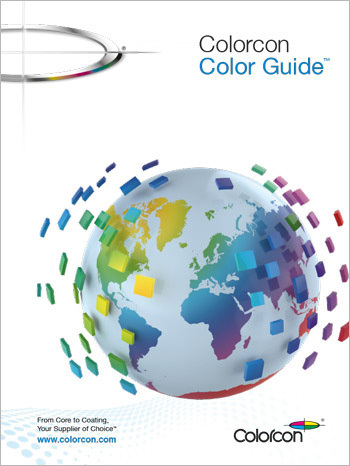 The information contained herein, to the best of Colorcon’s knowledge, is true and accurate. Any recommendations of Colorcon with regard to the products provided by Colorcon are made without warranty, either implied or expressed, because of the variations in methods, conditions and equipment which may be used in commercially processing the products. Colorcon makes no warranty that the use of the products provided by Colorcon will not infringe any trademark, trade name, copyright, patent or other rights held by any third person or entity when used in the customer’s application. The information contained in this document is not intended as legal advice, and should not be relied upon for that purpose. Any regulatory information provided is intended solely as initial general guidance. Each customer is responsible for determining the regulatory acceptability of the finished product in their specific application.